Lavender, a herb, has been used for over 2000 years of history. The Egyptians used it in their mummification process and decorative urns were found in the pyramids with residues still inside. The Egyptians also perfumed their skin with Lavender. Lavender, from "lavare" (Latin meaning 'to wash') or "livendulo" (meaning 'livid or bluish') was used by the Romans. The Lavender flower was used for cooking and added to the water used for bathing. 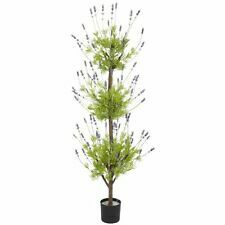 There are many varieties of Lavender plants that grow across different continents with over 30 different species in the genus Lavandula. Lavender's history has biblical roots. It is referred to as Spikenard in the Bible. Mary used it on the infant Jesus and anointed Jesus after the crucifixion when she was preparing him for burial. The early Greeks learned a lot about Lavender flower perfumes and the use of aromatic herbs from the Egyptians. The Romans learned about this knowledge from the Greeks and used Lavender flower lavishly in their public baths, to perfume themselves and their homes. They also valued it for treating ailments. This is were the history of Lavender for medicinal use began. During the Renaissance, it was used to protect against infections during the Plaque. Today we find out that it has many medicinal beneficial properties which help us in so many ways. We now know of its insect repellent properties and the Plague was carried by the lice on the rats. English royalty were particularly fond of Lavender during the Victorian Era. The Queen Victoria even appointed a official purveyor, her name was Miss Sarah Sprules "Purveyor to the Queen", and it was used throughout the castles for everything imaginable. Floors and furniture were washed and all the linens perfumed with its sweet scent. The Queen's interest and passion for this plant encouraged all fine English ladies to follow suit and scent themselves and anything else possible. There were street vendors carrying bundles of flowers for sale that they harvested from the hills and the women would craft flower Tussie Mussies. Lavender was found in just about every home herb garden. This demand brought about and encouraged cultivation and commercial farming to help keep up and maintain a constant supply for the royalty. Growing Lavender commercially got it start here. The Queen wanted a supply of fresh flower bundles brought to her daily. Lavender flower was strewn through stone castle floors and released it's scent under foot traffic. The scent of Lavender symbolized cleanliness and purity. This is how the history of English Lavender also called Lavandula angustifolia or Lavandula officinalis began. Street vendors sold Lavender bunches and would sing about their wares to get the attention of potential buyers. Some of their calls were printed in The Cries of London. Songs and diddles such as Lavender Blue became popular. In modern times Lavender was rediscovered by Rene Gatefosse, one of the founders of aromatherapy, when he burned himself in his lab. He immediately plunged his arm into its sweet essential oil and noted the quick healing, lack of both infection and scarring that resulted from his quick thinking. There has been a noted history of it being used in World War I as a wound dressing for injured soldiers. We now know that it has antibacterial properties which is another reason it is so useful. Provence is the largest producer / supplier of Lavender in the world. Other suppliers growing Lavender include Canada, United States, Australia, Japan, Bulgaria, Germany, Bulgaria, Russia, Spain and the Netherlands. With the return to natural products and natural health remedies interest has been revived in what herbs of olde can do and what conditions they can treat. A lot of modern day medicines have been derived from plant sources. Information on natural remedies and how they work is now of renewed interest by many seeking a cure from nature. Let's hope that Lavenders history of use continues and more is learned about its value long into the future!